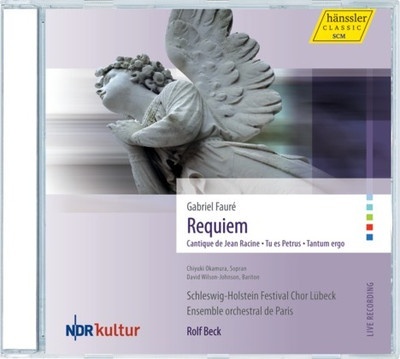 Gabriel Fauré's Requiem is one of the most beautiful works in the choral repertoire. Its intimately scored, modal melodies stand in sharp contrast to the terrifying visions of the Last Judgement found in the Requiems of Berlioz and Verdi. Composed between 1887 and 1890 (including an early version of the "Libera Me", which Fauré wrote in 1877), Fauré said of his most famous score: "As to my Requiem, perhaps I have also instinctively sought to escape from what is thought right and proper, after all the years of accompanying burial services on the organ! I know it all by heart. I wanted to write something different." Schleswig Holstein Festival Chor Lübeck, Ensemble orchestral de Paris - conducts Rolf Beck.